Please stop by our administrative offices and greet our friendly staff! This is the center of the congregation where you’ll most likely find the resource you need. You can meet our staff by following this link. The staff may be here before and after those hours so contact the office at: 518-463-7135 or office@albanyuu.org. Most of our important congregational documents are stored in the church “file cabinet.” If you are looking for a document, it probably lives there. You can browse through it by following this link. It takes a lot of people to operate and govern a congregation our size. The mission and strategic planning are their responsibility with congregational support. To learn more about our governance have a look at the documents in the file cabinet. Sometimes members and friends want to get a copy of a sermon or listen to a service again. To listen to a recent service, you will need login information to protect the Joys and Sorrows shared in the service. That login information can be gotten from the office. Please follow the links to the right to access these materials. Another resource of learning and education is our Joy Library. That can also be found on the Archives links. 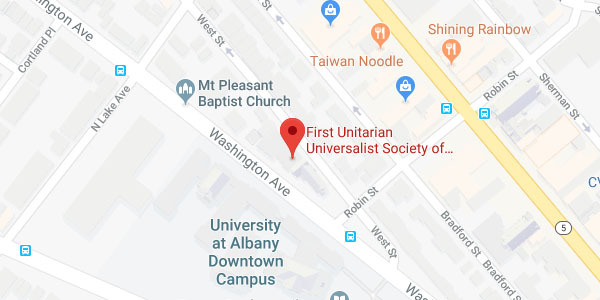 “Windows Weekly” e-mail newsletter sent on Thursdays is the source of all Albany UU news and events. Click here to subscribe. Use the online directory of members and friends, check the calendar, reserve a room using ChurchDB. Retrieve your password (contact the office for help) and get started! Usher, Greeter, Coffee Host—Sign up at the Sign Up Site in Channing Hall or online. Rev. Sam’s blog, “The Mostly Mindful Minister” and for the Times Union newspaper. We also have two closed groups on Facebook: “Albany UU News & Updates” and “Albany UU Social Action Issues”. To join either group, please send email requesting to join the group to office@albanyuu.org.